Nothing lasts forever, not even a $100 Never Ending Pasta Pass from Olive Garden. But that price will buy you all the pasta, salad, bread and soda you can stuff in your gullet for seven weeks from the chain eatery with its new gimmick. Despite the name, the never endingness of the deal is limited to seven weeks for whoever holds it. And there’s another really super big catch, besides the one that promises pasta forever — only 1,000 of the pasta passes will be sold, reports USA Today, starting today at 3 p.m. ET on the Olive Garden web site. 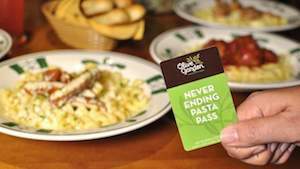 The passes are a piggyback PR stunt that goes along with Olive Garden’s Never Ending Pasta Bowl event this month. If you’re dreaming of bringing all your friends out to eat on the pass, you might get a stern glance or two but no one’s going to smack that fork out of your buddy’s hand. “Of course, if someone shares we do understand — we’re not policing the tables,” Spenchian explains, and doggie bags are fine as well.